In the hopes of shocking my body with a new workout and continuing to work on my "fitness goals" (in other words, just being lean and a better runner and achieving my "goal weight" - which I realize probably has the same stupid sound to it as Regina George's statement, "I wanna lose 3 pounds." But y'all get me. 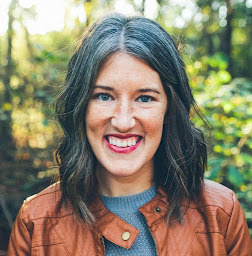 ), I enlisted my good friend, Kelsey, to help me. By the end, there were parts of my body that were hurting that I didn't even know could hurt from running. While running that last .25 mile, I realized something. This is why runners trip and throw up. BECAUSE THEY'RE GOING TOO FAST. I've heard stories about runners tripping during races or throwing up after a crazy run. And now, it all makes sense. My legs were like jello dangling from my body and my feet were mushy by the end. These aren't typically the sensations I feel after running 3 miles at a 10:00 minute pace. We haven't run together in several weeks, but I've tried to stay active-ish with either running or Slim in 6. As far as running is concerned, I'm definitely faster. I've done 1 mile in 8:28 and 2 miles in 18:03 - my fastest ever for those distances. 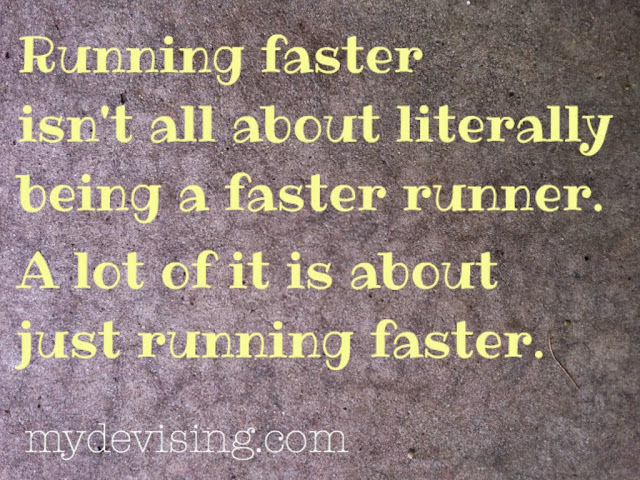 But running faster isn't all about literally being a faster runner. A lot of it is about just running faster. Like making yourself run faster even though all you want to do is order a vanilla coke and cheddar bites from Sonic. It's not like I'm a faster runner now forever and ever amen no matter what. I will have to work on it with every run and with every distance. I'm just really trying to push myself harder and harder to where faster is my normal. At first, it was hard for me to see the benefit of working at my speed for such short distances. I assumed that running a 9 minute mile for one mile wasn't going to help my half marathon time because we all know I'd have to slow down to an 11 minute mile to run that far anyway. But you just work on little bits at a time. First, one mile at a quicker pace and then gradually add distance while keeping that pace. My first real taste of the pay off of these runs was my 4 mile run a few Saturdays ago. To me, there is a big running wall in between 3 miles and 4 miles. When you cross over, you're in. 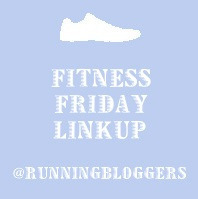 You're a runner, you can run long distances, you can run half marathons, you're in. That's how I felt at least. I remember the first day I ever ran 4 miles. It was in November of 2009 at Eldon Lyon Park on a Friday after teaching school. (Told you I remembered. I remember everything about everything. I actually serve as the memory for many of my friends' lives as well.) I was planning on running 3.5 (the farthest I had ever run at that point), but when I got to 3.5, I wasn't dead. I was very surprised by this, so I just kept running. I just knew I could do one more half mile. That day, I felt like a half marathon didn't seem so impossible. Maybe I could do it. All of that to say - that wall still semi-exists in my head. Not that I can't run 4 miles, but that I need to do it at a considerably slower pace or I will simply not survive. But instead of treating that Saturday run like a 4 mile run, I treated it like I would a 3 mile run. 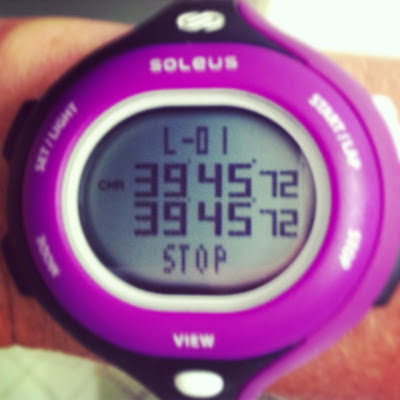 I started out at about a 9:30 pace, knowing (pretending) I could handle it. I have this fear of running out of energy, but I convinced myself that I could do it. I had run 3 miles and was starting my last mile. I had slowed down a bit and I knew if I wanted to finish under 40 minutes, I needed to push harder. Then I remembered the time I ran a mile in 8:28. Surely I could muster up a 9something mile right now, I thought. It's amazing how much of a mind game running is. Sure enough, I conquered 4 miles in 39:45. It felt amazing. I don't ever expect to be ridiculously fast. But running a 9:30 pace for a half marathon one day would be the coolest thing ever. Heck, averaging a 10 minute pace would be awesome for me! As for now, I'm working on maintaining a fast 2 miles and soon, I'll bump it up to 2.5. How do you runners out there increase your speed? Any tips or advice? I remember this from years ago when I was doing my master in exercise physiology and there was a big local 5K race in that college town. Some of my friends that lived in the dorm, they were elite runners in their countries, invited me to do the race. Foolish me didn't know not to get in the front line with them when the race started. I stayed with them for a mile and then dropped back, I thought I was going to die. I finished the race and flopped down in a corner of the gym and was about the throw up until my friends yelled my name that I came in 3rd in my age group. My running days are behind me now but I do have fond memories. Keep practicing and running with faster people you will eventually will get faster. You can also do speed training on a treadmill. You are quite the impressive lady!! Keep workin girl! Proud of you! It took me forever to grasp the concept of run slow to run faster. It really works! I've always wondered how fast do you have to run to the point of throwing up. Weird right. Great advice. 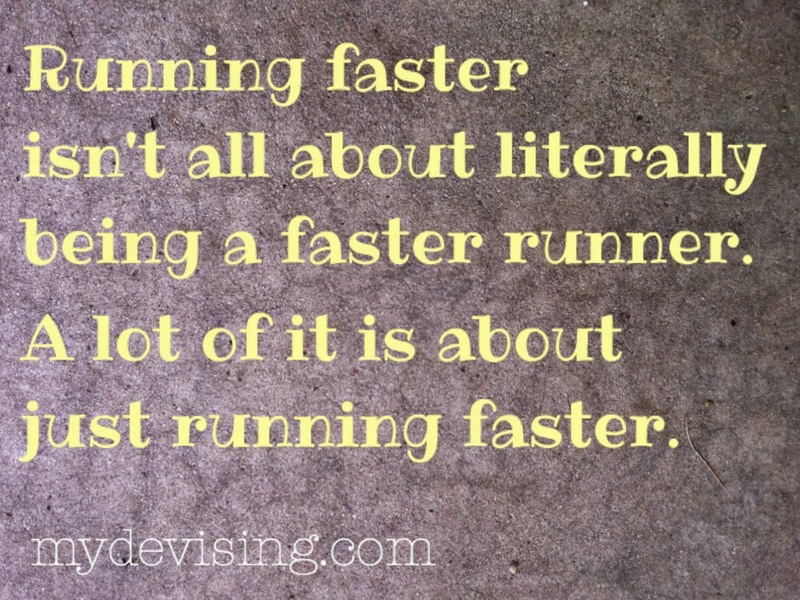 I think you're right about running faster doesn't have to mean literally running faster. I know I have it in me to go faster when I may not actually be going faster. Congrats on your awesome run! You are so right! Thanks for this post. While I definitely attribute doing my physical therapy like a good little monkey (scoliosis-based pelvic tilt, in short,) to the fact my times have improved, I also think that visualization does a lot. When I was younger I used to watch my dad with his eyes closed, unmoving with headphones on, knowing that in his mind's eye he was practicing his body building routine. When I do hip openers and goblet squat holds, or when I'm dreaming on the dreadmill, I picture myself faster. I visualize what it will feel like, how my stride will fall, the cadence of my steps and how the wind will feel rushing around me. It's almost like practice so that when I do go outside and try to break through to that next time or distance, I've already done it and it comes more naturally.